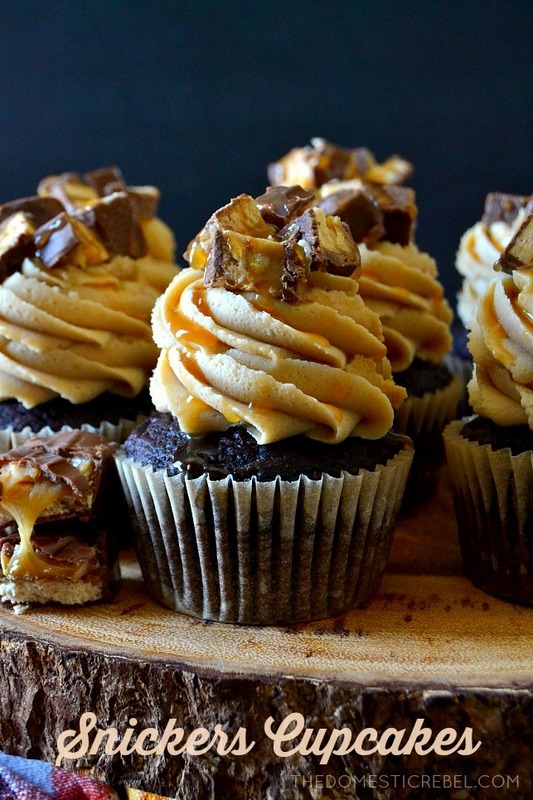 Use up any leftover Halloween candy to make these super easy and ultra tasty Snickers Cupcakes! Moist, fluffy chocolate cupcakes topped with a sinfully delicious peanut butter frosting, Snickers pieces, and a salted caramel drizzle! This time of year is my all-time favorite for many reasons. One, I’m a winter baby, so my natural habitat is cooler weather. I am just not cut out for crop tops, flip flops, and beach days. 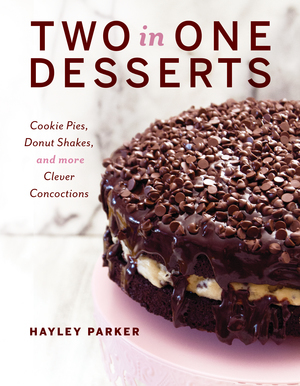 Two, this is my busy time of year for my blog and it makes me happy that so many people visit my site to get recipes to bake for these upcoming three important holidays! And three, because I am a holiday nerd and love Halloween and Christmas. But I won’t say that ‘C’ word (Christmas) until November. Promise. 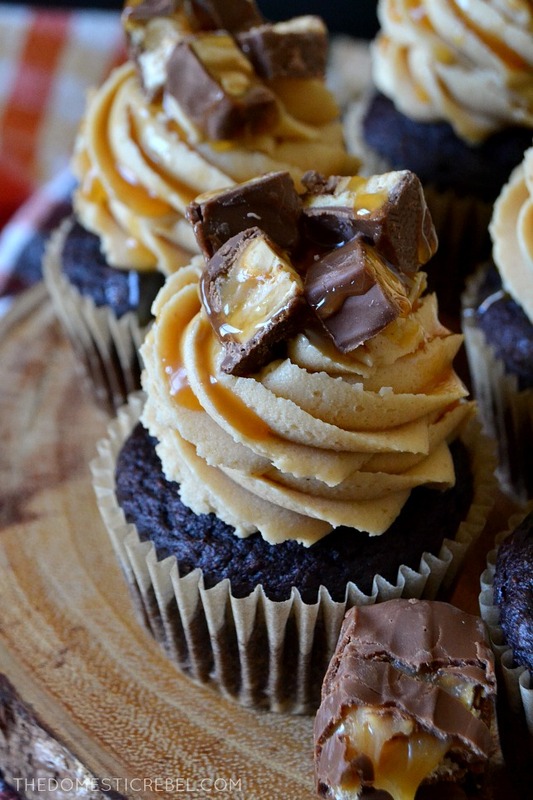 Seriously though, these Snickers Cupcakes are kinda perfect before and after Halloween. I know Snickers are a year-round food, but they just remind me so much of Halloween because my trick-or-treat bags were always filled with them. They must be one of the most popular candy bars here in the States, and I can see why! Salty, sweet perfection in each chewy bite… and how can you go wrong with caramel, peanuts, nougat, and chocolate? 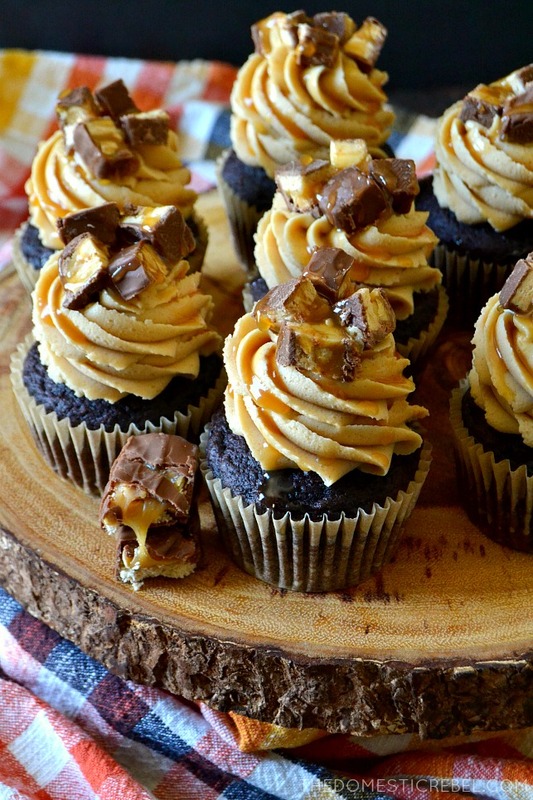 I’d say you could use up leftover Snickers bars to make these cupcakes… but let’s be serious. There are never any leftover Snickers bars. Much like “leftover wine”, leftover Snickers bars are purely mythical. But you know what I meant. These cupcakes are super easy because they come together relatively quickly without fussy ingredients. You can choose to make them entirely from-scratch with your favorite chocolate cake recipe, or use a box for simplicity. Up to you! 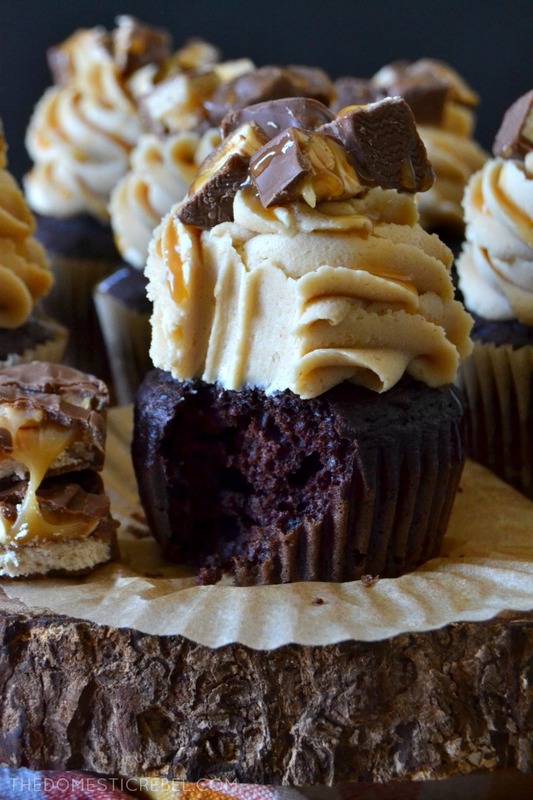 They start with a moist and fluffy chocolate cupcake that gets topped with a huge mountain of lusciously creamy peanut butter frosting. Top ’em off with chopped Snickers bar pieces and a drizzle of caramel sauce. Use your favorite jarred kind, or make your own! No judgments! Now stuff your face with them, obviously. These Snickers Cupcakes are super simple and ultra tasty! 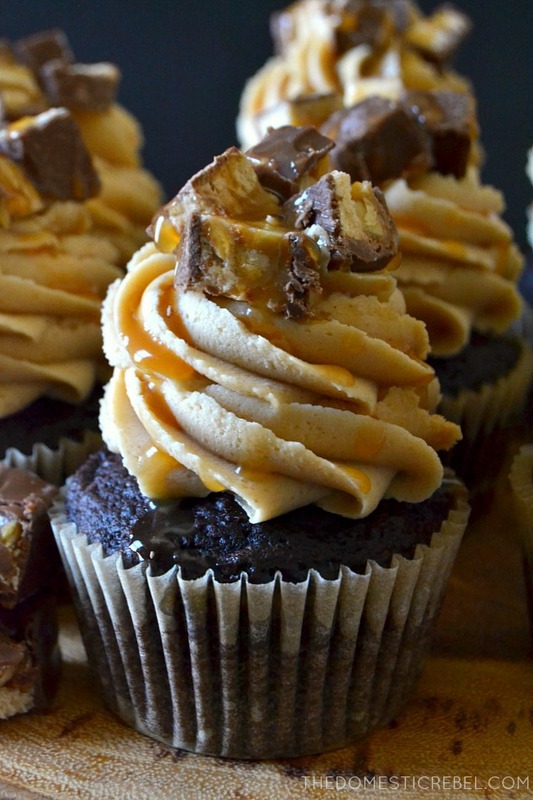 A moist chocolate cupcake topped with a silky peanut butter frosting, chopped Snickers bars, and a healthy drizzle of salted caramel sauce. 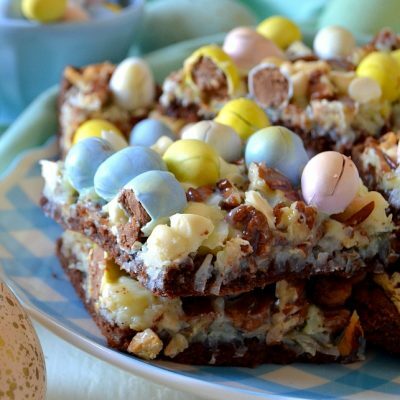 Make these easy with boxed mix, or substitute with your favorite scratch-made chocolate cupcake recipe! Prepare and bake the chocolate cupcakes according to package directions. 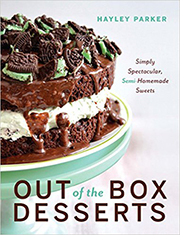 Or, if you're using a homemade recipe, follow your recipe to bake your cupcakes. Cool the cupcakes completely. In the bowl of a stand mixer, cream together the butter, peanut butter, and vanilla extract until soft and creamy, about 2 minutes. Gradually add in the confectioners' sugar, beating about one cup at a time, alternating with heavy cream or milk ONLY if the frosting appears powdery or dry. Frosting should be light and fluffy. Pipe or spread the frosting onto the cooled cupcakes. Garnish with chopped Snickers bars and a heaping drizzle of salted caramel sauce. I love how simple these are, but how PACKED the flavor is! These cup cakes look so good I just have to try them. I’ve done snicker brownies, but it never occurred to me to do cupcakes. Thank you for the recipe. Of course, I’m going to have to also try to not buy the snickers only for this project. Snicker snicker. The neighbor kids will probably do more than snicker at me if I should engage in such behavior. Maybe they’ll grow out of it?